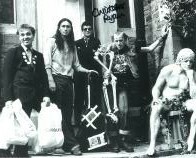 Ryan was the only Young Ones cast member who was not already well known in British comedy circles; he was a last-minute replacement for Peter Richardson, for whom the role of "straight man" Mike was originally intended along with The Comic Strip members Rik Mayall, Adrian Edmondson, Nigel Planer and Alexei Sayle. He played Lucky in Samuel Beckett's Waiting for Godot at the Queen's Theatre in the West End in 1991, alongside Mayall and Edmondson. Ryan later played Dave Hedgehog in Bottom and Marshall Turtle, one of Edina's unloved ex-husbands on Absolutely Fabulous. He has also appeared in two major sitcoms: he played one of the Driscoll brothers in an episode of Only Fools And Horses and spin-off The Green Green Grass, a pair of identical twin builders in the One Foot in the Grave episode "Hole In The Sky" and also a plumber in the episode "The Valley of Fear". He also appeared in Mr. Bean Goes Back To School, in two episodes of My Family, in Saxondale. Ryan also joined up again with Jennifer Saunders in two episodes of The Life and Times of Vivienne Vyle. In 1986, he appeared in the science fiction series Doctor Who as the alien creature Lord Kiv in the serial The Trial of a Time Lord: Mindwarp. He guest starred in SpongeBob SquarePants as Professor Percy in the 2006 episode Chimps Ahoy. In 2008, he again guest starred in Doctor Who in the episodes "The Sontaran Stratagem" and "The Poison Sky", as the Sontaran leader General Staal, and in the 2010 episode "The Pandorica Opens", playing another Sontaran character, Commander Stark. In 2012 he appeared in the role of "Marshall" in Episode 3 "Olympics" of the Absolutely Fabulous 20th Anniversary Specials.